Every athlete eventually has to figure out their place in this world after athletics. Personally, I was not ready for mine, I mean how many athletes are mentally prepared for their career to end? My transition was a little different than most athletes. Normally, athletes know when their career will end because they competed for their allotted time or they personally decided they were done with their sport. I wasn’t so lucky. After having a great career as a high school athlete, I expected my college career to end up the same way. Yeah, college sports are extremely different than high school sports, but I still believed I had a fighting chance to succeed. However, my body did not agree with those thoughts. Starting college cross country at Arizona State University, I came in as a 2012 Team State Champion, placing 9th individually in California, and competing at Nike Nationals. Physically I was in the best shape of my life, focused, determined and highly motivated. Almost a little too motivated. When I arrived at college, I started training at a very high intensity. My workouts were remarkable, especially for a freshman. However, I failed at recovery. To give you some insight into the sport of running, there are recovery days. Days in which you are supposed to run at an easy pace, to recover from days that you have more intense workouts like mile repeats, or tempo runs (a consistently fast pace run, for a decent amount of miles). I didn’t take those recovery days like I should have. I pushed myself every day, so hard that my body broke. Well specifically, my hip…twice. And to make it worse, in between those broken hips, I got Mono, a disease that causes constant exhaustion. I was forced into medical retirement from my running career. The doctor stating “if you are to break it again, you would need surgery and not walk properly again,” at this point I had to think of my health. My career wasn’t too bad though, I mean, I can say I traveled and competed as a freshman and sophomore at Pac 12s on a D1 team. I had great teammates and tremendous coaches who I owe everything to. I also was able to stay on scholarship after I medically retired. The athletic department agreed to continue paying for my scholarship through medical funds. This allowed the money that came from the track team to be given to another teammate who deserved it. If it wasn’t for the remarkable coach I had, I would not have been able to keep my scholarship the way I did. Now that I could no longer compete, train, or run, I was lost. Being so in love with my sport, I never considered what I would do if my career were to end early. Lost because my identity had been in athletics since I was a child. Playing eight different sports throughout my lifetime, I was defined as an athlete. I had athletic friends, an athletic lifestyle and athletic goals. When someone asked me who I was I would say, a cross country and track athlete. I had no idea how to define myself outside of athletics. I became miserable, depressed, and scared of my future. But I mean who wouldn’t be when something they loved so much got taken from them? I was insecure and consumed with how people perceived me and that insecurity weighed down even more when I stopped running. What would people think if I was not an athlete? What would they say? Would my friends still be my friends if I was not on the team? Would people still like me if I wasn’t an athlete? Would people think that I was weak, made excuses, and lazy? How would I be defined now? Trying to understand my place in this big world, I took up my coaches’ idea of becoming the team’s undergraduate coach for a year. What a struggle that was. How was I supposed to consider myself done with the sport, if I was still immersed in the lifestyle, going to practice at 5am and living with my teammates? My coaches talked about how I needed to remove myself as part of the team, to gain respect as a coach. Yeah, that didn’t work out well. They were my best friends, how was I supposed to tell them what to do? On top of that, I missed running, a lot. I yearned to compete with my teammates, not watching them from the sidelines. I wanted that runner’s high you get after completing a tough workout. I longed to see my name on the results list. And lastly, I wanted something to work towards. Don’t get me wrong, it gave me joy when my teammates did well, but I wanted to be out there competing with them. I wanted to truly be part of the team. I felt worse and worse as time went on. Watching them do the very thing I loved, made me feel dejected and tortured. I realized, I needed to step away. I decided to reach out to the Athletic Advisors for opportunities to further my career and passion. This was the best decision I made. They helped me obtain an internship with the Arizona Diamondbacks Baseball Team, where my passion started to transpire. That internship with the Diamondbacks led me to become part of a new team. I worked in Stadium Operations for Arizona State Baseball. I started regaining my joy and comfortability in who I was as a person and what I wanted my life to look like. Yes, I was still involved in sports, but I was not tortured because it was a completely different atmosphere than being on the track team. I understood how I could contribute and utilize my skills without being an athlete anymore. Through the internship with Arizona State Baseball, I realized my new passion. 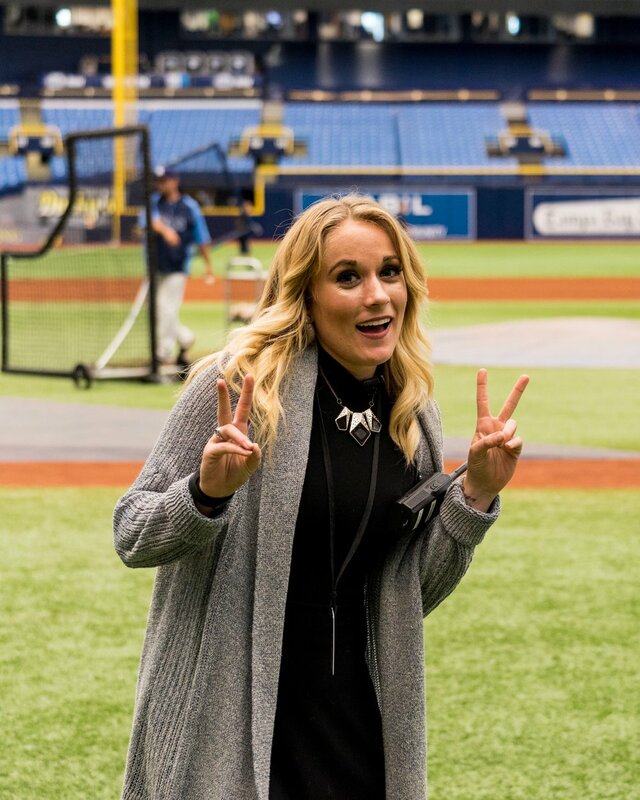 I wanted to be an event coordinator and took a Stadium Operations position with the Tampa Bay Rays. I loved working in baseball, and it was a huge learning experience. Being so far from my roots, I jumped on a job opportunity back in Arizona as an Event Coordinator for Steve LeVine Entertainment. Now, I help plan, coordinate, and work events such as the Ostrich Festival, 5k fun runs, Phoenix Open, Scottsdale Fashion Show, small corporate parties, DJ bookings and more. I now understand who I am after removing myself from the track and field world. I thrive on helping people enjoy events and creating an amazing environment to do so. Of course, I am still growing and understanding my purpose. But, I finally understand who I am without defining myself in sport. I am still learning how to worry less about what other people think, but it’s a process and I have made bounds of improvements from two years ago. For those of you struggling with the transition, know it will get easier. I challenge you to reach out to people who’ve gone through the transition from sport to the professional world. Know that you’re worth more than your sport, this world is huge, and there is more to life than being an athlete. Don’t focus on the past, but look where you are now and where you could be. Find your passion and stick to it, just like you did with your sport. Miranda graduated from Arizona State University with an Exercise and Wellness degree with a certificate in Leadership and Management. She is currently an Event Coordinator for an entertainment company in Scottsdale, Arizona. In her free time she studies financial trading and social media marketing. Miranda is always looking for ways to improve herself and her work. She loves to travel, is a proud dog mom, and a big baseball enthusiast.